I lived here on Punta Banda for 30 years.I have seen many changes some good some bad. I see this as a great plan for all concerned.Yes the economy is struggling in the states. The people here in Mexico have a very hard time makings ends meet also. This golf course is a great lift to thies folks.The mexican people love our way of life and Americans also.Mexico has it’s problems with drugs but then again so do we in the USA.What better way to give mexico a taste of Americana than by playing some golf. Dude…you must know that this course is not being built for Mexicans to play on. It will only be open to the very wealthy homeowners who can afford multi-million dollar estates. The Mexicans will get a few jobs mowing lawns and cleaning houses, and at what cost? The permanent destruction of some of the most beautiful, natural land in Mexico. Ensenada can do better than to sell out their unique natural resources to a handful of billionaires to build another playground that you and I will never be invited to. You live in a beautiful area of Mexico…preserve what makes it special and develop projects that will benefit everyone, while preserving what makes it so special. As you know, the real name of the site for the proposed development is “Punta Banda” and not “Punta Brava”. The promoters of the project are avoiding mentioning the real name because they don´t want their project to be related to a huge scam and fiasco in Punta Banda a few years ago. Also, I wanted to let you know that this project has created a lot of social stir here in Ensenada, because the project plans to remove more than 90% of the vegetation destroying a pristine ecosystem of coastal sage scrub and more than 25 archaeological sites in that area. Of course, since the project is very exclusive, the rest of the people from Ensenada won’t have access to that cultural landscape anymore, it will be alienated. My perception of the project is that in fact they do not care about cultural and natural heritage issues as well as local economical development or better: sustainable development, In fact, they looked to approach to us (a group of citizens interested in the conservation of the site) in order to obtain sensible data or first-hand information that could help them to improve the presentation of their project and this way manage to successfully surpass “paperwork” without changing the essence of their project. This way, they would also manage to legitimize or certify it to the eyes of the Mexican authorities and public opinion. Because of all these reasons, we decided not to establish any kind of negotiation with the promoters of the project and we have made a series of decisions that could result in integral conservation of the area, by recognizing its character of Cultural Landscape because of its irreplaceable natural and cultural attributes. Finally, the area is located on top of a major active geological fault (Agua Blanca fault). I agree with you Mr. Simmonds, because the area that the Developers call “Punta Brava” for us, in Ensenada is call “La Lobera”, is not only a very well preserved area of mediterranean flora, is one of the few patches we had left because all the development from the border to here, but it also has very important area we call “concheros” that are the remains from the first humans living in the peninsula, more than 5,000 years ago. In this part of Mexico, we don’t have piramids, we only have this remains (concheros), we also have wonderfull submarine caves, a marvelous view and many other gifts that nature gave us, and as soon as it became a “high class development” you can be certain that the gates for all of us Mexicans will be close to enjoy that espectacular place, that we want to continue calling “La Lobera”. It should be preserved. Finally, next Tuesday, December 09, 2008, there will be a Public Hearing which will be held here in Ensenada (Hotel San Nicolas, 8:30 a.m.) in order to present arguments in favor or against the project (Punta Brava)as well as questions and observations regarding the way the project is planned to be developed. 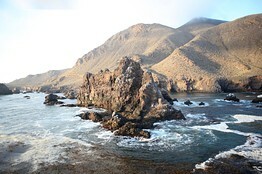 We will insist on the integral conservation of the Cultural Landscape of the Punta Banda Peninsula. We will keep you posted and let you know about the advances of the hearings. Moika– thanks very much for the update. Please do report back as this develops. If there is additional news about this that I can post as a new entry please send it to me at dave@mexicopremiere.com.